Sitting from left: Assoc Prof Dr. Umaporn Suthutvoravut (President of Nutrition Association of Thailand), Prof Dr Le Thi Hop (President of Vietnam Nutrition Association), Dr Tee E Siong (President of Nutrition Society of Malaysia), Prof Dr Hardinsyah Ridwan (President of Food and Nutrition Society of Indonesia), Dr Rodolfo F. Florentino (Chairman-President of Nutrition Foundation of the Philippines, Inc.), Prof Dr Mohd Ismail Noor (Vice-President of Nutrition Society of Malaysia). Standing from left: Ms Yvonne Chwee (SEA-PHN Network Secretariat), Ms Cyndy Au (DuPont Nutrition & Health), Dr Mahenderan Appukutty (Nutrition Society of Malaysia), Dr Ma Socorro Ignacio (Nutrition Foundation of Philippines Inc), Mr Victor Basuki (DuPont Nutrition & Health), Ms Zalma Abdul Razak (Ministry of Health Malaysia), Dr Kit Phanvijhitsiri (PepsiCo Asia Services Ltd), Dr May Khin Than (Ministry of Health Myanmar), Ms Anke Sentko (Beneo Asia Pacific Ptd Ltd), Dr Do Thu Thuy (Ministry of Health Vietnam), Ms Susan Kevork (Nestle), Mrs Florentino, Dr Jacques Bindels (Danone Nutricia Early Life Nutrition Asia-Pacific), Ms Goh Peen Ern (Beneo Asia Pacific Ptd Ltd), Hj Zakaria Kamis (Ministry of Health Brunei Darusalam), Ms Muhaini Hussin (SEA-PHN Network Secretariat). The meeting reviewed the previous Minutes from the 4th General Meeting held on October 21, 2016 in Hanoi. All council members, associate members and guests shared a brief update on activities from their respective associations/organisations during the past year. The meeting reviewed the annual report which documented the key activities and milestones that have been achieved by the Network since its establishment in June 2014. The 1st Southeast Asia Public Health Nutrition Conference in conjunction with the 32nd Scientific Conference of NSM, conference was successfully organised by NSM, under the auspices of SEA-PHN Network and attended by about 480 attendees from 23 countries. There were scientific sessions ranging from keynote address and plenary lectures by distinguished senior/pioneer nutritionists in Southeast Asia, symposia sessions by various key opinion leaders, lunch symposia by corporate partners and round table discussions. There were also competition for the Young Researchers’ Awards (oral & poster), Free Paper Presentations and more than 200 posters displayed. The council members have agreed on the Train-the-Trainer approach. The meeting discussed on the implementation details. The meeting discussed on the compilation of NPAN of SEA Countries, including the template. Meeting attendees are encouraged to propose ideas for future activities of SEA-PHN Network. The council is to serve a 3-year term. 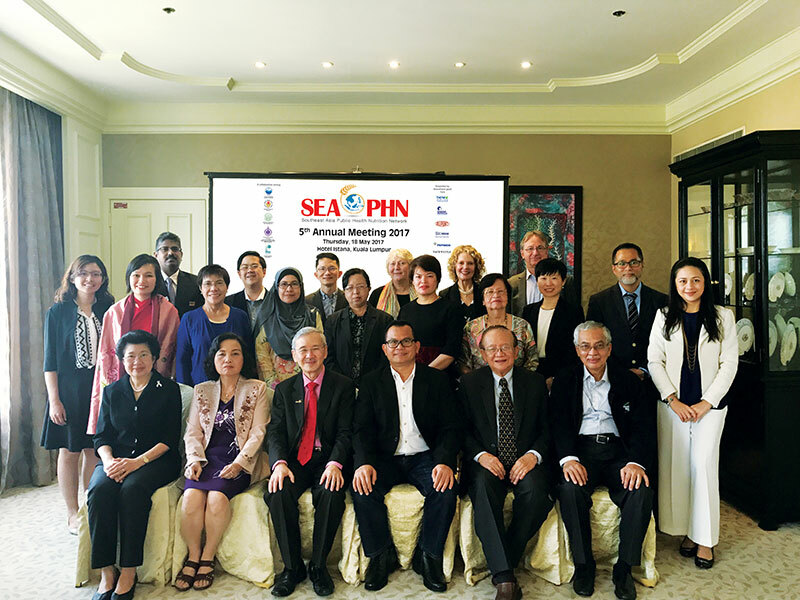 Election was held to elect the new term of SEA-PHN Network Council.